Over the next few weeks in August, I will be writing a series called “Journey with the Teacher”, sharing my journey from beginning student to teacher of the honored and ancient practice of yoga. Through this series, I also will offer advice and considerations for how to approach your practice and for selecting the right yoga guide for you. I firmly believe that there is an art and science to teaching any subject; I honor this mission always in my teaching practice. After 17 years, I am still learning, and that is the best part of all. I hope to inspire you to embark on your own journey as a student and/or teacher of yoga. Accompanying the first installment of this blog series is an announcement. I am honored and excited to reveal that a feature article highlighting my work with Mind Body Dancer, the community of teachers and students of yoga that I officially founded in 2009, can be found in the August 2013 issue of Dance Teacher Magazine (please visit http://www.dance-teacher.com/ or pick up a hard copy to read and share the piece!). Everyone who practices yoga remembers his/her first yoga class. Grateful for my personal yoga lineage that inspired me to bring this work to others and wishing to honor my first yoga class and teacher, I offer you a story of my own. In 1997, I was an MFA candidate at NYU Tisch School of the Arts in the East Village, NYC. To complement my dance career, I was seeking new outlets of discovery involving my body as a performing artist and athlete whenever time allowed beyond my busy schedule of technique classes and rehearsals. I had heard rumblings of a yoga school nearby. For recent residents of NYC, I should interject here that in those years there was not a yoga studio on every corner of the city! This felt like I was going on an adventure to a secret, underground club. It felt important to go on this adventure alone. I recall the short walk from Tisch Dance up along 2nd Avenue. I climbed the outside stairs from street level to enter into a hallway where I climbed up another flight of stairs that entered directly onto the premises of my first yoga school, Jivamukti. David Life was my very first teacher. At this time Jivamukti still enjoyed an intimate setting – secluded, understated, and familial. I now know how fortunate I was to have begun my studies in this way before yoga “the trend” took over some of the authenticity of teaching that was more available to those of us practicing then. I was a beginner. It was all so new. I recall how welcoming the woman was standing at the top of the stairs who checked me in to class. She was gentle and kind as she showed me where to put my mat in a storage space so it would be there for me each day. I remember applying the silver duct tape tab that wrapped over the edge where I put my initials, indicating it was mine, so it could be found easily. 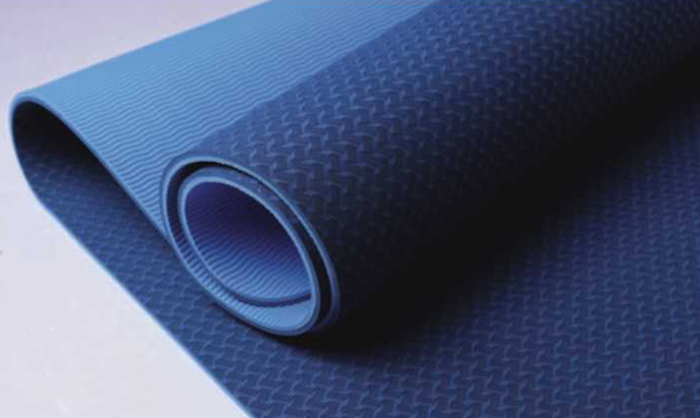 Yoga mat choices were wonderfully simple then: blue or purple or green. I remember the little space where I changed behind a curtain and could read flyers on old bearded yoga gurus and vegetarianism and kirtan events. I remember taking my shoes off and feeling like I had just arrived home. I remember entering into a long single room to find a spot for my mat, encountering serious practitioners hanging on ropes in inversions and sitting in meditation preparation for asana practice. I remember adventuring to the little room in the back where there was a kitchen where you could have tea or a drink of water. I recall the smell of a special incense brew that infused the space. Even today when I catch a whiff of it in a studio or from a street vendor’s table, my heart-space expands three times its normal size with love and joy. I remember the people practicing around me – diverse, focused, and present. I am sorry to disappoint all of you yoga-pose-sequencing fiends out there, but I don’t remember the postures or pranayama that day. I don’t remember the philosophy lesson that was expertly presented to begin our class. Just like every yoga beginner, I looked around a lot when class began. I learned by watching and listening and experimenting. Being physically strong and flexible, I remember having fun moving in a new way that challenged me. I remember being able to follow along with ease because there was some familiarity to dance. The raspy sounds of ujjayi breath intrigued me, the yogis literally floating from one posture to the next during sun salutations amazed me, and the relative silence and collective focus of my fellow practitioners supported me. After one hour and forty-five minutes (“express” yoga was not even on the menu back then) spent in this other world, I left my first yoga class. The overwhelming sense of having been on a journey was refreshing. What I now know was probably the result of a connection of mind and body and the activity of my central nervous system left me feeling balanced and open. I remember feeling a bit light, perhaps even dreamy. Once again on 2nd Avenue, reconnecting to the edgy buzz of the East Village in NYC, I knew I had found a treasure! You always remember your first teacher. David’s genuine connection to the practice guided me, through example, to embark on my personal yoga journey that day. Though I don’t remember what he taught, the wisdom of the practice was evident through his guidance. Time and space also had roles in delivering me an opportunity for which I am eternally grateful. They set me off on an adventure that continues to excite, reveal, and challenge. I have returned to the mat day after day since then and have been fortunate to have so many wise and compassionate teachers along the way. I am grateful to each of my teachers, my students, my yoga lineage, and the ability for this ancient practice to translate for all who wish to learn from it today. So, what is YOUR first yoga class story or memory?